Need more information about booking Home 9142413 ? Experience living in your own Private Borgo! 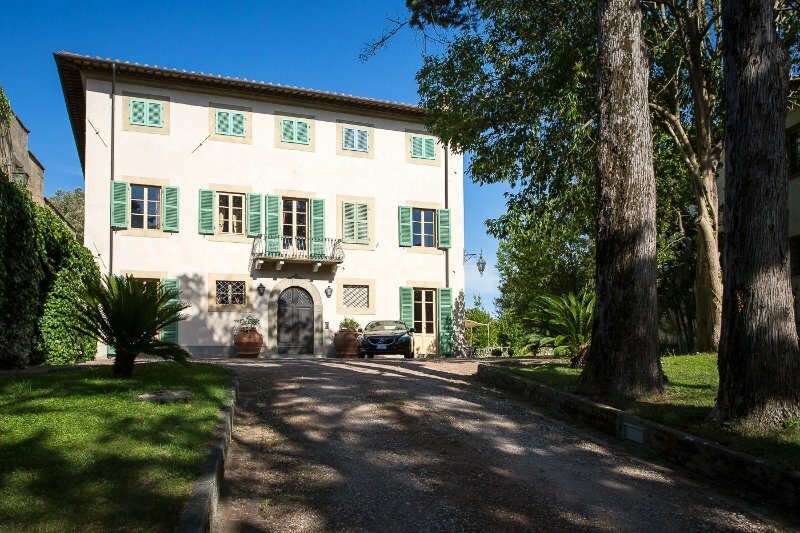 With its 2000+sqm of interior surface and 2000smq of Gardens and Terraces with majestic views these Beautiful Tuscan Villa and its Annex will ensure the most perfect stay for your big party as it can easily accomodate 32 people in wide and beautiful bedrooms. Private Pool, Hot Tub, Pizza Oven, Plenty of space to relax and mingle! Extra Beds are available upon request. Maximum occupancy with extra beds: 40 guests. We can't wait to have you here! Access YOUR Villa via the electric gate, follow the drive way and let your adventure begin! This beautiful Borgo will be your own for your stay, gated and fenced will be perfectly safe for your kids to run and explore around and for everyone to enjoy the peace and beautiful surroundings. The Villa is spread onto 3 levels. On the Ground Floor a big entrance leads into the multiple living areas: 2 Reception Rooms, 1 Formal Dining, 1 Great Living Room, Big Kitchen, Wide Staircase. You will also have your own Private Elevator to reach every floor and a Fully equipped Laundry. First Floor: 5 bedrooms (3 Ensuite, 1 Family Room (2 bedrooms w/shared bathroom), 1 Game Room w/pool table. Elevator and Staircase. Second Floor: Chinese Room and TV Room w/small Kitchen (all combined: Family Room), 5 Bedrooms all Ensuite. A/C on the whole Floor. Elevator and Staircase. Garden: Big Dining al Fresco, Sunterrace, Pool w/loungers, Tables and Chairs. The Garden has automatic lights. Access to the Annex. The Annex is spread onto 2 levels. Ground Floor: A small garden will connect you to the Villa, right on the Pool Side, you will also have additional Private Parking on the side entrance and of course your own Private Entrance. A big window/door will give you access to the Ground Floor: Living, Dining and Professional Kitchen (perfect for Your Event(s) or Daily Meals w/Private Chef), 1 Bathroom, HUGE living space w/pool table, Private Terrace, 2 Ensuite Bedrooms. Climb one of the two staircases to get to the Annex's first floor where a STUNNING Terrace will take your breathe away, look at the beautiful Tuscan countryside while you read a book or sip on a glass of our Locally Produced Wines. The Annex 1st Floor comes with A/C in all its 3 bedrooms, 2 Full Bathrooms, 1 Small Kitchen, 1 Small Living Area, 1 Open Dining/Living Space w/majestic Glass Archway Doors made by the same company who did the Pyramid Du Louvre! Admire the Beautiful views from inside on a hot sunny day and Enjoy a beautiful dinner w/candle lights in the evening with your Friends and Family. Right next to the Annex there's our Fun House! Learn how to make Pizza and bake it in a classic wood oven, relax on the Terrace looking over the Hills or Dive into the big Hot Tub facing the green Tuscan countryside! The Fun House also has a Bathroom and Changing Room! Borgo Cevoli is all this and MUCH MORE! Pisa International Airport (PSA) is 35minutes away by car and Florence International Airport (FLR) is 1hour away. The Ocean is 40minutes to 1 hour away by car depending where you choose to go, you can reach Marina di Pisa or Viareggio, Forte dei Marmi and so on all within 1hour drive. There's a big supermarket 2kms away from the Villa. Whether is for a doubt, planning a nice Tuscan Dinner, a Wine Tasting, Massages, Trainings or Sightseeing I'm just one call/text away! I love interacting with my guests. And You'll have the chance of seeing me on multiple times during your stay to help you out (if needed). Being a host since 2010 I had many chances of meeting great guests and loved having them into my houses. I'll be more than happy to show you my places and give you the "Local Experience". Congierce 24/7, Your stay can be fully personalized on your needs! - Be Mindful, Respect the property. Extra Guests must be communicated prior to your arrival or they won't be accepted. - Pet friends are welcomed but they must behave. - Events, Parties and Weddings can be arranged. Just ask for more informations. You can get in touch with Fabio (the owner) through the contact form on this page. Send Fabio (the owner) an email through the contact form on this page. Alternatively, if there’s a phone number on this page, you can call them. How do I contact Fabio (the owner)? If you’ve already booked, go to Manage your holiday booking to view Fabio the owner's contact details or send them a message. Or send Fabio (the owner) an enquiry through the Contact the owner/manager form if you’d like a quote or more info first. When you pay online through the Book your stay form, a booking request is sent to Fabio (the owner). You’ll find out within 24 hours whether they’ve accepted - no money will leave your account before then. You can also request a quote from Fabio (the owner) through the contact form. The owner will email you the total cost for your dates and a link to book and pay online. Use the Book your stay form to pay provisionally online. You can pay by credit/debit card or PayPal. Fabio (the owner) will have 24 hours to accept the booking and no money will leave your account before then. Why can't I call Fabio (the owner) before booking? You’ll need to contact Fabio (the owner) to do this. Send them a message in Manage your holiday booking or through the contact form on this page. You can request to change the dates or number of people on your booking via the Manage your holiday booking page. To change your holiday dates use the Edit booking button. If you need to change the number of guests staying then send Fabio (the owner) a message. If Fabio (the owner) agrees, they’ll send you a revised quote outlining the changes. You can review and accept/decline this from the Manage your holiday booking page. You’ll have 48 hours to take action before the revised quote expires. Estimated price per night based on a weekly stay. Owner fees of £607.00 per stay may apply. Enter your dates to see the total cost.